Today is Sabbath (See Genesis Chapters 1&2, Exodus chapter 20). I just received a delivery of flowers to brighten my day. These flowers not only remind me of the beautiful surrounding nature that God created but they remind me that I am still healing. I spent the very first Sabbath of this year (Jan 5th) in the hospital as a patient. I remember the nurses calling to me that I had a special delivery. I went to the nurses station and saw a HUGE bouquet of tropical lush flowers. I think I might have even exclaimed, “These look like they are from the Garden of Eden!” The next question I asked was, “Who are they from?” I wanted to know who to thank but the nurses said they couldn’t find the card. So I thanked my Heavenly Father because He is the one who created all heaven and earth and sea and filled those spaces (heaven, earth, and sea) with good things to be enjoyed by me, His daughter. One of the nurses later found the card for my flowers and I found out they were from my cousins. The following Sabbath (Jan 12th) I was blessed to have been discharged from the hospital two days before (Jan 10th) and had the opportunity to attend church. Since. I was a visitor I was blessed to take home a poinsettia as a gift. I hope to plant it here at home. The poinsettia in order to change colors and flower require darkness. The poinsettia can have no light during that period of night time. I ended up in the hospital because I was working too hard and stressing myself out and was lacking sleep. I have to get my sleep in order to function well. I, like the poinsettia need to get “hours of uninterrupted darkness” or sleep in order to brighten up the day with beautiful colors. Of note, the poinsettia in Spanish is called “Noche buena” a reference to Christmas Eve. Literally translated it means “good night”. Yes I’m learning how to get the adequate sleep that I need so that I can function. Last Sabbath (Jan 19th) I was blessed to give one of my friends flowers. She is a wonderful friend and I wanted to share with flowers so earlier in the week I searched for the perfect bouquet that had many purple flowers. I like purple as well so when I saw a purple bouquet of flowers at a local farmer’s market I knew that was the one for her. I know that my favorite flowers are yellow & white but I am also a fan of tiger lilies! Today as I mentioned earlier I received yet another surprise of flowers! 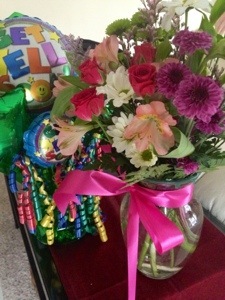 These flowers are from my aunt! They are so beautiful and of course I asked “who could they be from?” Luckily the little card was there and it mentioned that my aunt’s church is praying for me. I am a walking answer to prayer. I am so blessed to have a loving God and family as well as one that prays. As I already mentioned I am reminded that I am still healing. The road to recovery looks like its going to be a long one but I know that I can trust in God to walk beside me and at times carry me until I am restored.